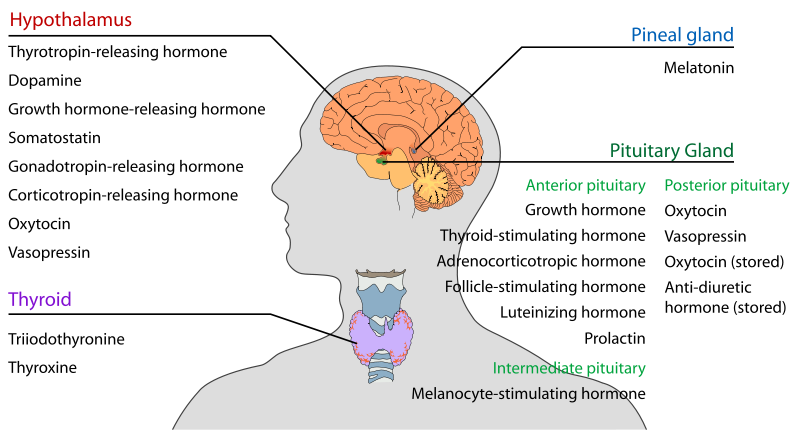 Pituitary is and endocrine gland located within the sella turcica, residing inside the skull. It is about one cm in diameter and weighs about 0.5 -1 gm. It is connected through the pituitary stalk with the hypothalamus. 1. Somatotropes producing the human growth hormone (hGH). 4. Gonadotropes producing luteinizing hormone (LH) amd follicle stimulating hormone (FSH). a.Thyrotropin releasing hormone (TRH), stimulating the production of thyroid stimulating hormone. b. Corticotropin releasing hormone (CRH), stimulating the production of adrenocorticotropic hormone. c. Growth hormone releasing hormone (GHRH), stimulating the production of growth hormone. 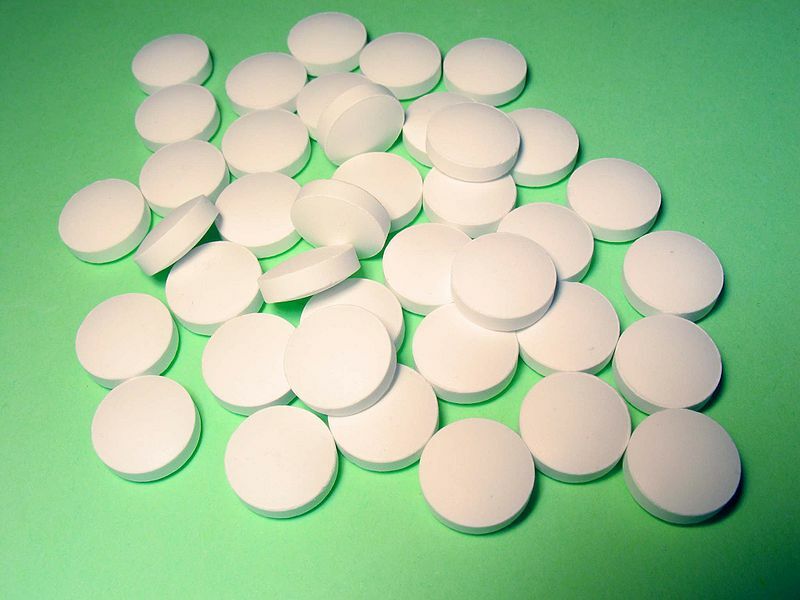 d. Growth hormone inhibitory hormone (GHIH), inhibiting the production of growth hormone. e. Gonadotropin releasing hormone (GnRH), stimulating the production of FSH and LH. f. Prolactin inhibitory hormone (PIF), inhibiting the release of prolactin. Growth hormone, also known as the somatotropic hormone or somatotropin, is produced by the somatotrophs. It is an important hormone for growth and development. a. Increasing the number of cells. b. Increasing the size of the cells. A decrease carbohydrate utilization is observed along with a decrease in glucose uptake by the tissues, accompanied by increased glucose production by the liver. An increase in insulin production is also observed, but it is unable to mediate its effects of decreasing glucose levels in blood (this is attributed to the increased levels of free fatty acids, which hinder the effects of insulin). Thus growth hormone is a diabetogenic hormone producing pituitary diabetes (due to overproduction of glucose and decreased utilization). Growth hormone increases the utilization of fats and increases fat mobilization. It causes an increase in the levels of free fatty acids in the plasma. The levels of acetyl Co-A (produced from the free fatty acids) also rise in the body, thus fats are used for providing energy to a greater extent, while carbohydrates are spared. Thus, under the influence of growth hormone, an increase in lean body mass is observed. Increased production of acetyl Co-A also lead to increased formation of ketone bodies, thus causing ketosis. Longitudinal growth involves the increase in bone length which occurs at the epiphyseal plates. The chondrocytes undergo mitosis and there is deposition of new cartilage. Ossification of new cartilage results in the formation of new bone. There is, thus, elongation of shaft in longitudinal growth. The horizontal growth involves the increase in bone thickness. 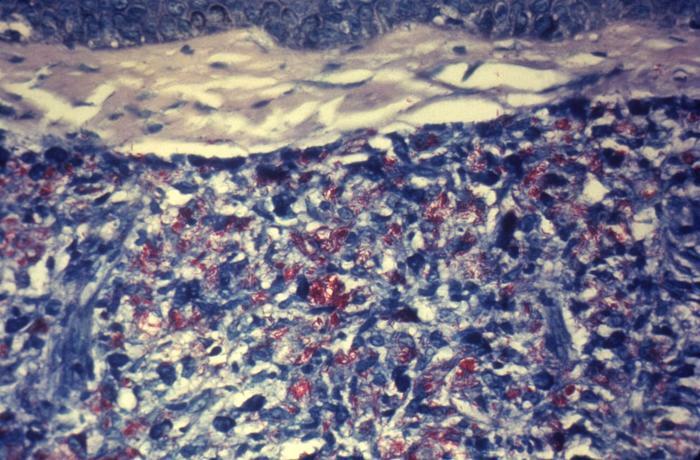 The osteoblasts deposit new bone while the osteoclasts remove the old bone. The rate of deposition of bone is greater than the rate of resorption. There is ,thus, increase in thickness of the shaft. Somatomedins are small proteins synthesized in liver under the influence of growth hormone. These are also known as Insulin-like growth factor (IGF). They increase all aspects of bone growth. Somatomedins have longer half life than growth hormone. There are four major somatomedins, but the most important is the somatomedin C (IGF-I). African pygmies have a congenital inability to synthesize somatomedin C. Their plasma growth hormone levels are normal or high, but they remain small statured. The Levi-Lorain dwarves have the same problems. Hypothalamus releases growth hormone releasing hormone (GHRH) which increases the production of growth hormone. It also releases growth hormone inhibitory hormone (GHIH), which inhibits the production of growth hormone. The GHRH acts through the cAMP dependent 2nd messenger system.Short term influences are mediated through the calcium influx while the long term effects through the transcription and new hormone synthesis. Growth horomone has anti aging actions due to the fact that it increases the deposition of proteins, at the same time decreasing the deposition of fats. Person has a feeling of increased energy. Panhypopituitarism can occur in children as well in adults. In children it may be congenital or due to tumors, while in adults it is due to tumors or thrombosis of pituitary vessels (Shehaan’s syndrome). Features include stunted growth but it is proportionate (unlike cretinism). Person is mentally normal. Increase GH before adolescence results in gigantism. Features involve increased growth of body tissues, increased height accompanied by hyperglycemia/ diabetes. Increase GH after adolescence results in acromegaly. The person can not grow taller but soft tissues continue to grow and bones grow in thickness. 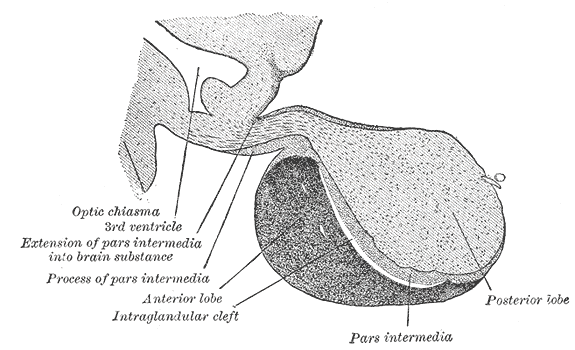 e. Enlarged nose, tongue, kidney and liver. Posterior pituitary gland is also known as neurohypophysis because it is the neural tissue outgrowth from hypothalamus. Pituicytes (glial like supporting cells) and nerve fibers from supraoptic and paraventricular nucleus of hypothalamus are present within it. Carrier proteins are the neurophysins, which carry the hormones from hypothalamus to posterior pituitary. Hypothalamus controls the release of hormones from the posterior pituitary gland. Antidiuretic hormone or vasopressin is secreted from the hypothalamus. 5/6 is produced in the supraoptic nucleus and 1/6 in paraventricular nucleus. ADH regulates osmolarity within the body. 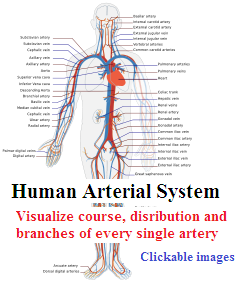 ADH plays a role in maintainence of blood pressure by vasoconstriction. Osmoreceptors are present within hypothalamus or around it. Hyperosmolar extracellular fluid pulls out fluid from the osmoreceptos, which results in shrinkage of osmoreceptors. The shrinkage of osmoreceptors signals ADH secretion from the hypothalamus, which restores the normal osmolarity. 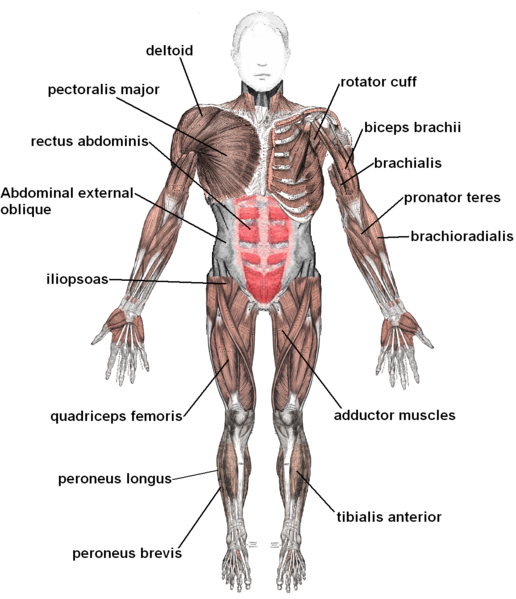 Stretch receptors are present within the right atria. They are excited by overfilling. Their excitation inhibits ADH secretion (volume reflex) which decreases blood pressure. Decreased stretch of baroreceptors results in an increased ADH secretion. ADH acts on collecting tubules and collecting ducts. It binds to its receptors (V2), which results in activation of adenylyl cyclase. Activated adenylyl cyclase results in the formation of cAMP, which causes activation of cAMP dependent protein kinases. Activated protein kinases cause phosphorylation of aquaporins, which results in insertion of aquaporins into cell membrane. This increases permeability for water. ADH binds to its receptors (V1) resulting in activation of Phospholipase C. It causes formation of IP3 & DAG which releases Ca++ from intracellular stores. This causes activation of Protein kinase C which results in phosphorylation of cell proteins producing cell response. In this syndrome there is excessive secretion of ADH. Increased ADH causes increased reabsorption of water resulting in hyponatremia and overhydration. This increases ICF volume and decreases ICF osmolarity. There is inability to secrete ADH or respond to it, as a result of which large amount of dilute urine is excreted, resulting in dehydration and increased ECF osmolarity. Oxytocin causes uterine contractions and milk letdown phenomenon. As a result of stretching of cervix, signals are sent to the hypothalamus, which causes the release of oxytocin from posterior pituitary gland. 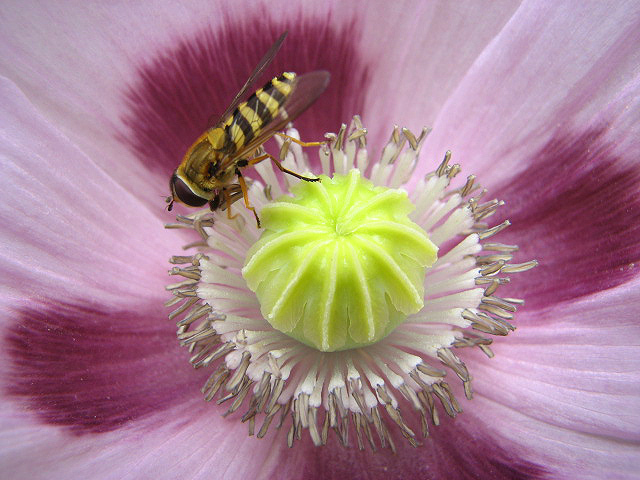 The oxytocin released causes contraction of uterine muscles. 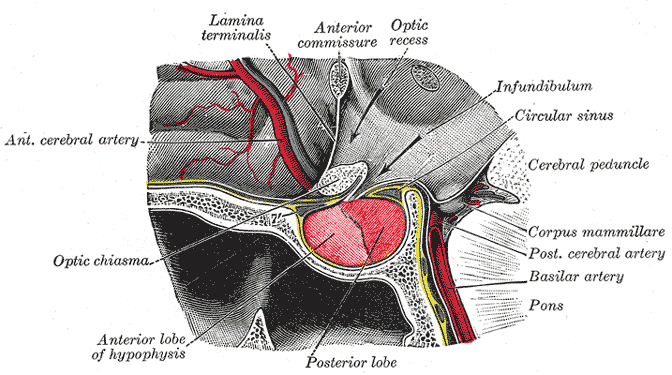 The stimulus is suckling by the baby which sends sensory signals to hypothalamus resulting in release of oxytocin from posterior pituitary gland. Oxytocin contracts myoepithelial cells, causing milk ejection.